Teeth-replacing dental implants not only look life-like, they’re made to last. For one thing, the metals and dental materials used in them are impervious to bacterial infection. But that doesn’t mean implants are impervious to failure. Implants depend on the bone and other natural mouth structures for support. If the bone becomes weakened due to disease, the implant could become unstable and ultimately fail. Peri-implantitis, the condition that can lead to this kind of failure, is a major concern for implant longevity. It’s a type of periodontal (gum) disease triggered by plaque, a thin film of food particles that can build up quickly in the absence of adequate brushing and flossing. The gum tissues around the implant become infected and inflamed. If the infection isn’t properly treated with renewed oral hygiene and clinical plaque removal, it could spread below the gum line and begin to damage the underlying gum tissues and bone. This could destroy the all-important connection between the titanium implant post and the bone. The implant could eventually loosen and become completely detached from the bone. The key is early intervention before the bone becomes damaged. 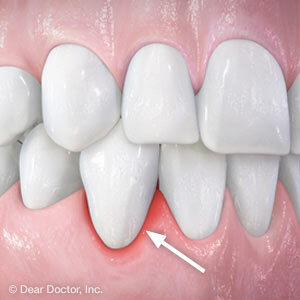 Besides plaque removal we may also need to apply antibiotics in some form to control the growth of disease-causing bacteria. If the disease has fairly advanced we may also need to consider surgical repair to strengthen the attachment between implant and bone. You can help to avoid peri-implantitis altogether by practicing consistent daily brushing and flossing around all your teeth including the implant, and seeing your dentist at least twice a year for cleanings and checkups. And by all means see your dentist if you notice any signs of gum swelling, redness or bleeding. Staying on top of your gum health will help not only the natural tissues and remaining teeth in your mouth, it will help preserve your implants for decades to come. If you would like more information on maintaining your dental implants, please contact us or schedule an appointment for a consultation.